Is sensitivity a key element in successful art? Much is written about the senses and sensitivity. Opinions are all over the board on whether sensitivity matters and whether artists and creative people are more sensitive than others. Does it take a deeply sensitive person to create the type of art that touches the senses of the audience? Do viewers instinctively react more forcefully to art created by the more sensitive artist? One artist describes the feeling of acknowledging this sensitivity. Vanessa Turner writes, “I have often felt that I was more sensitive than those around me, more affected by my surroundings and the energy of an environment than your average person.” Artists capture what is missed by so many in the hustle and bustle of daily life. Some would say artists are merely taking the time to stop and look around more often. Artists spend time contemplating surroundings and therefore see more. But that explanation is too simplistic. Otherwise many more people would be artists. Carolyn Edlund of the Artsyshark.com interviewed psychologist and researcher Douglas Eby of TalentDevelop.com. Eby says “being a highly sensitive person is a trait in 15 to 20 percent of people but it seems to be much more common among artists.” Eby quotes from an article on CNN saying “people with this trait tended to have more brain activity in the high-order visual processing regions.” Evidently artists have more brainpower! The highly developed sensitivity of the artist’s brain transfers into the hands of the artist and onto the art in the form of energy. Art lacking deeply felt sensitivity is just draftsmanship. Without energy the art falls flat. Technically correct art is without emotion. It takes emotion to touch others. It takes sensitivity to create emotion. Of sensitivity, Vanessa Turner states, “It makes life beautiful.” And that beauty is what shows up in the art. This entry was posted in art, artists inspiration and tagged artist's sensitivity, Painting, sensitivity. Bookmark the permalink. ← Do The Numbers Matter? Hi, Mary – I’ve been nominated for The Sisterhood of World Bloggers award, and in turn I’ve nominated you. I really enjoy and appreciate your posts, they’ve added a great deal of awareness to my work as a photographer and artist. If you don’t want to accept this award, that’s fine, just wanted you to know how much I appreciate your blog. Here’s a link to my post about the award where you can pick up the details and photo of the award. Take care. Best regards, Mo. Thank you so much, Mo! I am deeply honored! I love checking in with your blog to see your latest artworks and to learn more about picmonkey. And the banner today, Mary Gwyn …? Banner??? Some days I’m a bit slow!! 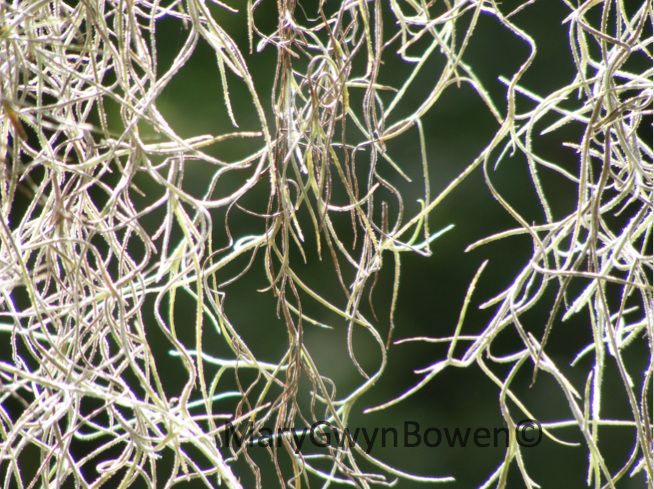 Spanish Moss has a wealth of intricacies if one has the sensitivity to look closely! Spanish moss I can recognise, Mary Gwyn: the subject of my enquiry is the artwork of the actual site …? I would like to have it. Just send it down here, OK? – I’m sure you have plenty. Thanks!! I am working on some prints of it and others and hope to have them soon. Reblogged this on Jill Joy – Art That Transcends. Hi Mary, I was doing some online research on artists and sensitivity again and came across your blog post which referenced my blog post (how cool!). I wanted to thank you for taking the time to read my post and also sharing your thoughts on artists and sensitivity. I actually find it is a very difficult thing to balance because the world is rather harsh for the sensitive person and can certainly feel overwhelming and unforgiving. But despite all of that when one learns to harness their sensitivity (and I’m still learning) it definitely can make life beautiful. I enjoyed what you had to say and felt you were right in what you wrote! I also agree that it isn’t easy to harness sensitivity! Like you, I’m still learning too!! ©Mary Gwyn Bowen and Painting Pundit (2013). Unauthorized use and/or duplication of this material without express and written permission from this blog’s author and/or owner is strictly prohibited. Excerpts and links may be used, provided that full and clear credit is given to Mary Gwyn Bowen with appropriate and specific direction to the original content. All photos, videos, and art on this site are created by and the property of Mary Gwyn Bowen and Gladey Hollow, LLC unless otherwise stated.